Claude Monet liked poppies, red poppies in the fields and pink poppies in his garden at Giverny. His painting of his wife and son walking in a meadow full of poppies is one of the most famous of musée d’Orsay in Paris. All the poppies are currently in bloom in his flower garden at Giverny, tiny or enormous, scarlet or pink, orange, yellow, some one color, some two. 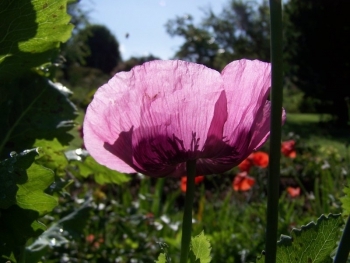 The pink and purple poppies are spectacular. Monet preferred one color flowers but he also used two color flowers just as he could take two colors with his brush on his palette and put them in one gesture on the canvas.